When most people think of a rosary or prayer beads, the Roman Catholic Rosary is most likely to come to mind - or perhaps Muslim, Buddhist, or Hindu Prayer beads. Eastern Orthodox prayer ropes or beads are also very popular. But, the use of prayer beads is increasing among people of many Christian faith traditions, including the Anglican Communion, of which the Episcopal Church is a part. The use of beads (or knotted cords, or stones) to count prayers exists in early records of nearly every spiritual tradition. The use of prayers beads fosters contemplative, meditative, and reflective prayer. The use of prayer beads creates a rhythm that discourages distractions and focuses attention so that the one who prays can more readily move into God’s presence. Within Christian churches the use of prayer ropes/beads in the Eastern Orthodox tradition (using the Jesus Prayer and a meditative focus) and the Rosary in the Roman Catholic tradition (using meditation on the life of Christ and his mother Mary) both go back thousands of years. Anglican Prayer Beads (also referred to as the Anglican Rosary) is a relatively new prayer form that dates back to the mid 1980’s. Its design comes from a group of Episcopalians (Praxis) who melded the Eastern Orthodox Prayer Rope and Roman Catholic Rosary to create a new “Anglican” form. 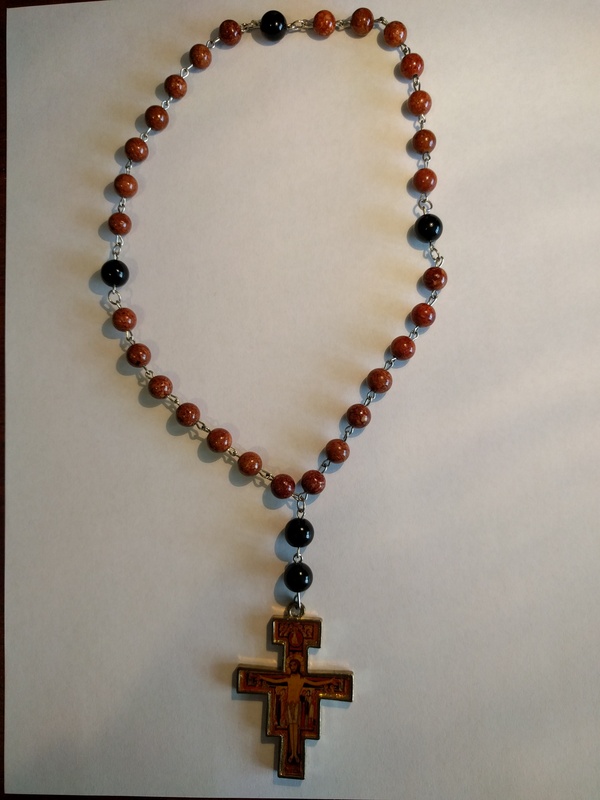 Anglican Prayer Beads are grounded in Anglican incarnational theology and also draws heavily form the Celtic tradition which celebrates the sactity of all of God's creation. They are made up of four groups of seven beads. Each of these groups of seven beads are called "weeks". The symbolism of the design of Anglican Prayer Beads is significant. Seven represents the number of days in the secular week, the number of days in creation, the number of seasons in the Anglican church year, and symbolizes wholeness or completion in the Bible. The four Cruciform beads form a cross and symbolize the four cardinal directions (north, south, east, and west) the four gospels and the four primary elements (earth, water, wind, and fire). The Invitatory, or entry bead, just above the cross invites us into prayer and contemplation. The full number of beads totals 33 - the number of years that Jesus lived on the earth and also corresponds to one of the forms of the Chotki, the Eastern Orthodox prayer rope with 33 knots. The movement through the prayer beads begins with the cross, moves to the invitatory bead, on to the first cruciform then around through the week beads and other cruciforms. Often there are three rotations through the circle of beads ending with the final invitatory bead and cross. In true Anglican tradition, there is no singular or “correct” way to use the prayer beads. There are some guidelines as well as some resources that may be useful to get started. The following is a very simple form that I use most often. WEEK BEADS: Jesus Prayer - Lord Jesus Christ, have mercy on me. This cycle may be completed three times. After the fourth week and last cruciform, repeat the Invitatory. FINAL CROSS: May the God of hope fill me with all joy and peace in believing through the power of the Holy Spirit. The Lord's prayer may be said on the final Cruciform in place of “My God and my All”, and sometimes a different final invitatory is used. Some forms have different short meditations that are used for each "day" within the week. I prefer a minimalist rota of prayers (closer in meditative practice to the traditional Jesus Prayer). 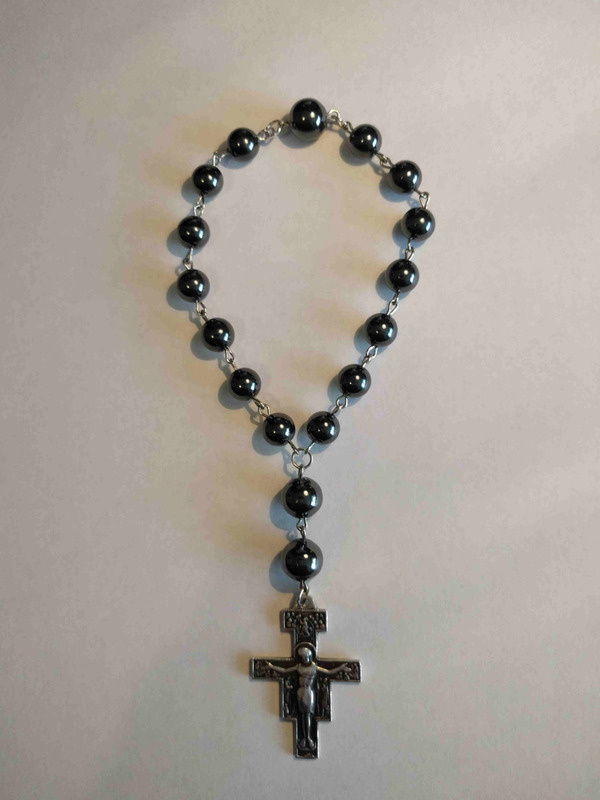 But, again, the beauty of Anglican Prayer Beads are that the user can develop forms that best resonate to their spirituality and style of prayer. There are several sources of information and sample prayer forms available on the internet. Typing "Anglican Rosary" or "Anglican Prayer Beads" into any search engine will yield hundreds of results. I am a person who commutes to, from and within New York City. As such, I often have spaces of time available to me for prayer. This chaplet takes less room in a pocket, and is more convenient to use on the railroad, subways, etc. Following is another form that I also use with the Anglican Prayer Beads/The Anglican Rosary. Both here and in all your churches throughout the whole world we adore you O Christ, and we bless you, because by your Holy Cross you have redeemed the world. Most high and glorious God. Give light to the darkness of my mind. Give me right faith, certain hope, and perfect charity. Lord give me insight and wisdom, so I might always discern your holy and true will. May all Franciscan saints pray for us. May our Lord Jesus give us his blessing and His peace.